Momma Told Me: Remember to eat the rainbow. No, Momma wasn't encouraging he consumption of Play Doh, or sniffing Smelly Markers; she was referencing an age old piece of wisdom in health advice. Let's face it, if most of your foods are on the brown spectrum (french fried, hamburgers, chocolate shakes), you're probably not getting a good mix of nutrients and vitamins. As fun as eating can be, it does serve a very important role in our quality of living, outside a delicious endeavor. Just as most people have a favorite fruit and/or vegetable they love; many of us avoid eating several healthy foods because we simply don't like the taste, texture, or preparation. Juicing, or the act of pureeing one's fruits and veggies can help mask unwanted flavors while encouraging the intake of positive nutrients. I have several friends who have gone pretty far with this 'juicing trend,' but it shouldn't be a trend- there is a difference between consuming multiple meals a day of entirely juice and incorporating the ease and benefits of fresh juice into a daily diet. Much like the pasta noodles made of veggies, hidden fruits and vegetables in a single glass of juice can more than double the average adults intake of vital nutrients and vitamins. Of course there are a few things you will want to keep in mind, as well, when beginning to incorporate juice into your diet. 1.) 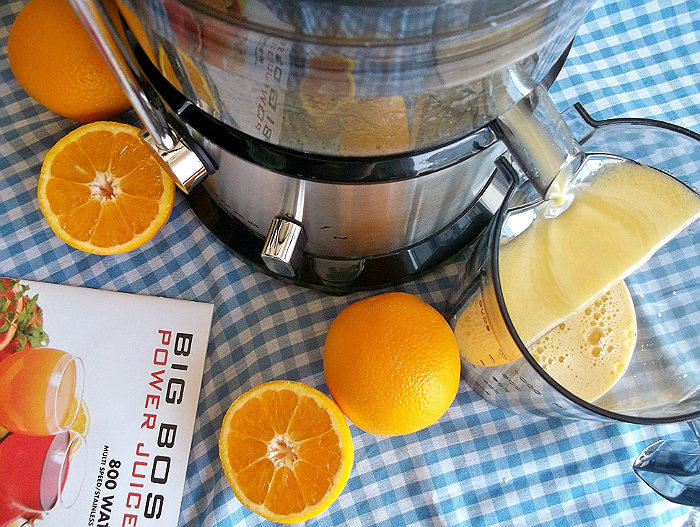 Use the pulp: We recently acquired a #BigBossKitchen Power Juicer, which finds itself in the mid-range of juicing appliances. It doesn't have a range of fancy settings, but is easy to use, and very powerful. The inclusion of an extra large pulp catcher allows the user to reserve the separated pulp of fresh fruits and veggies for cooking sauces, and recipes, to encourage the retention of valuable fiber most often found in the pulp. 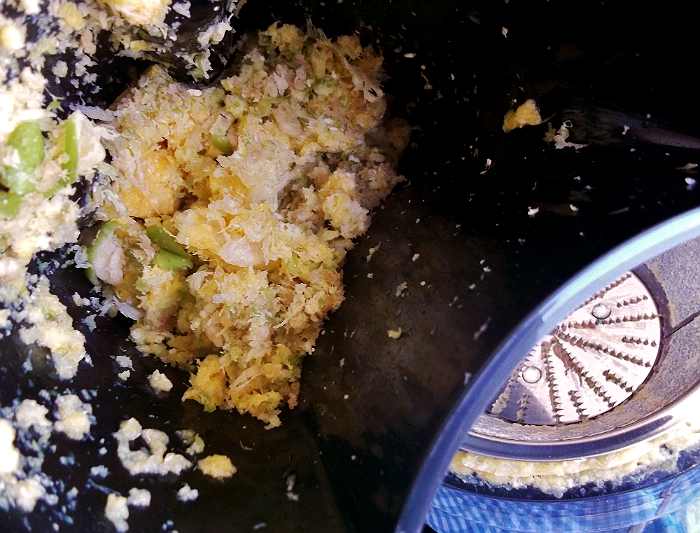 Because machines like the Power Juicer do such an efficient job at removing moisture from the pulp they are especially handy in baking recipes such as muffins and bread. 2.) Drink it fresh: It may seem like common sense but the quality of nutrients, and the experience of the juice itself, declines shortly after initial processing. Fruit is kept ripe and fresh as long as possible inside a skin; once that skin has been removed the fruit (juice) must be stored in refrigeration at an appropriate temperature and should be consumed within 48 hours. 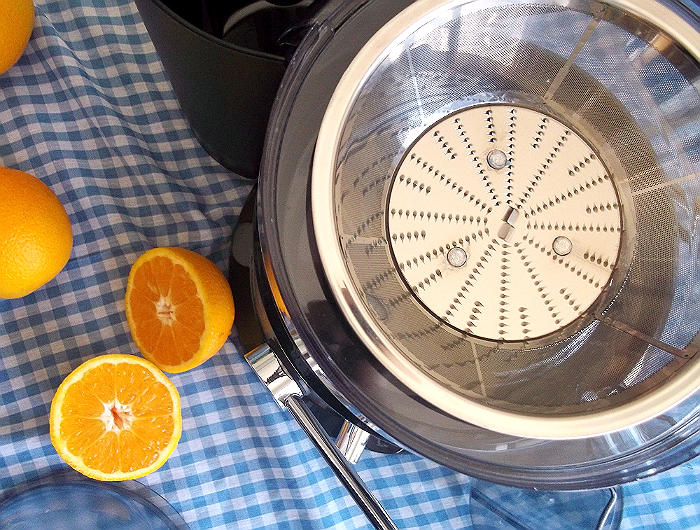 Having an easy to clean juicer is key to keeping up with the needs of juicing day to day. 3.) Cut Calories: Many people do not consider the amount of natural sugars and calories present in fruit juice, or the concentration of these calories within a single cup of processed fresh juice. Because units such as the Power Juicer do such a good job of extracting the liquid from a fruit with minimal waste, one tends to consume more fruits and vegetables than they would if they were having to chew and eat them whole. This also means the flavor is much stronger and richer, allowing for the addition of additional vegetables that will help keep you full and cut the calories of pure fruit juice. Recall the color spectrum? Try to fit 3+ colors in your juicer, you just may be surprised how delicious new combinations of fruits and vegetables can be. You can also successfully cut calories by blending a smaller portion of juice with ice and protein rich Greek yogurt for a delicious smoothie option. 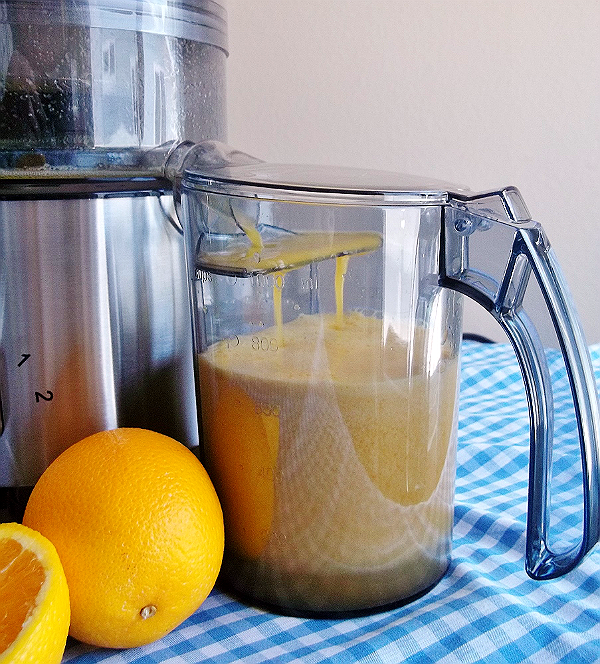 It sounds odd to say we've been juicing for a few weeks now- We use our Big Boss Kitchen Power Juicer more to enhance our everyday diet, not to dramatically alter it. Carrot Juice is a big favorite in our house when added with a little carob powder and ice, while green apple orange juice is absolutely delicious and creamy when fresh. I love being able to feed whole fruits and veggies into my Power Juicer without peeling or cutting, thanks to the 3" wide feeder. However, sometimes we peel citrus fruits to cut down on the acidity of juice for those in our household who suffer from heartburn. The Power Juicer is even great for processing cooked vegetables like broccoli, for a quick soup base that is rich in nutrients! 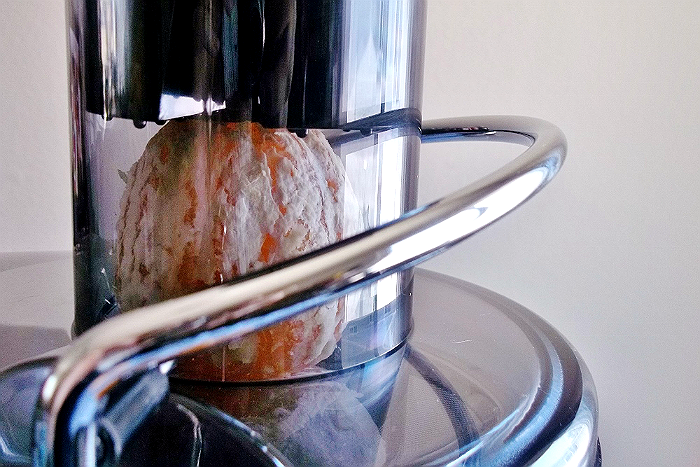 Choosing your first juicer will likely be the most stressful part. 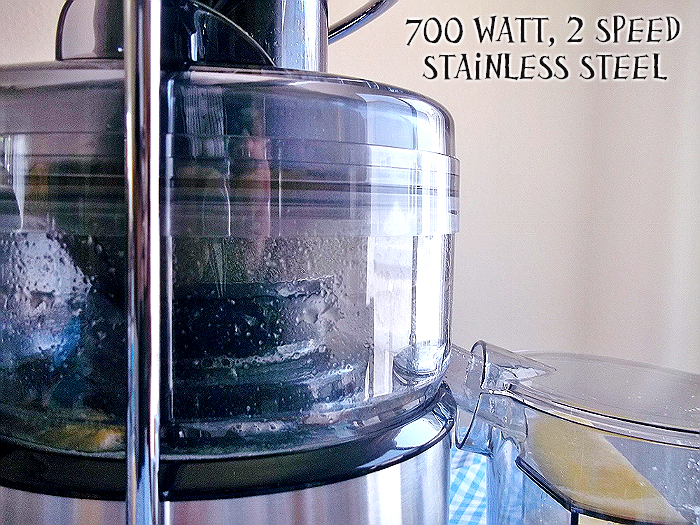 I suggest a unit that is powerful, but easy to operate, such as the 700 Watt Stainless Steel Big Boss Power Juicer. The force of the blades and motor pulls fruit and veggies down into the colander basin without manual effort from the feeding tube. I've also noticed, while it is super efficient in separating pulp, our juices seem to retain some finer fiber that is easy to drink and smooth. The unit comes with a handy juice carafe to juice directly into, though the force of initial juicing can be quite strong and will splash up along the lid; something that could make a mess if juicing into alternate containers at home. 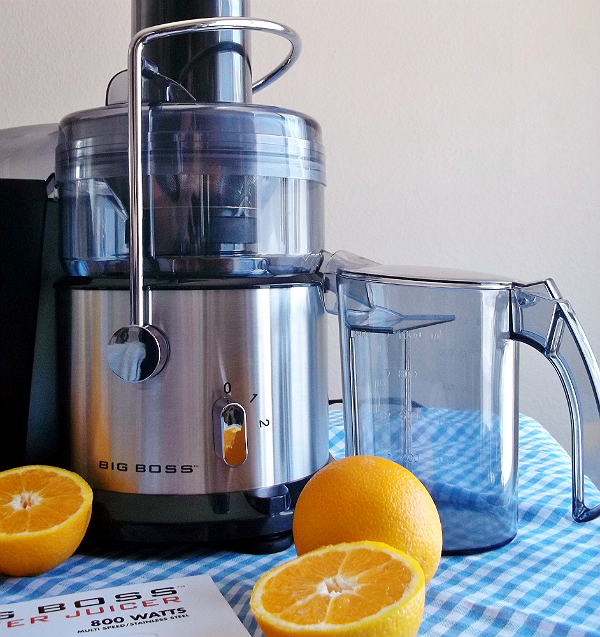 Much like other Big Boss kitchen products, the Power Juicer is very simple to assemble and clean, making this a great juicer for those who wish to enjoy fresh juice, at home, daily. We never seem to let any product go to waste around here now, when something gets too ripe it gets juiced! 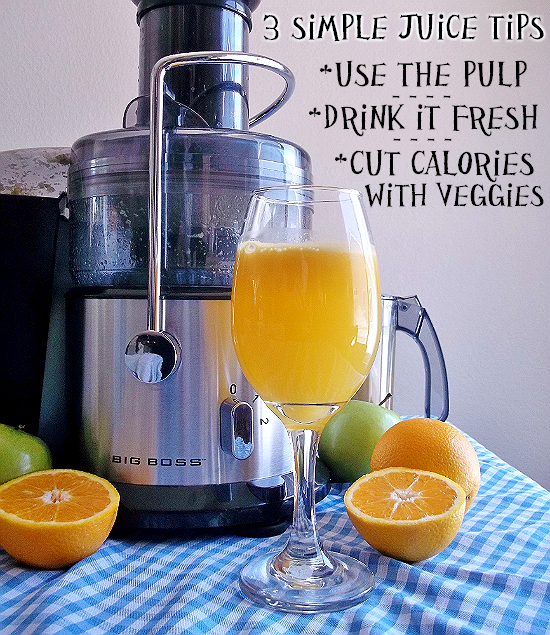 And making fresh juice at home is much cheaper than buying it in store, something that makes a starter juicer a great gift idea for any family or friends looking to improve their lifestyle. Check back during Blog POP! 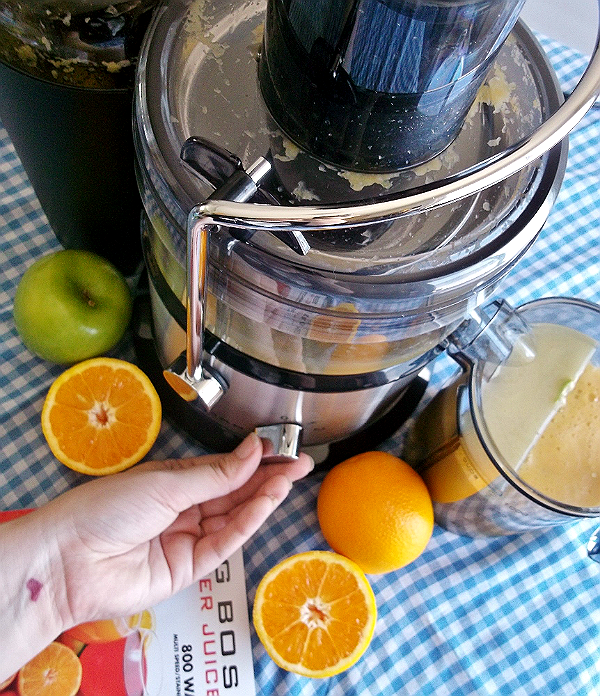 School Rules (August 7-10) to enter to win a Power Juicer of your own! Have you ever enjoyed fresh juiced juice? Do you notice the difference? What Daughter Says: Encourage a nutrient rich diet with hidden fruits and veggies in fresh juice. I've been wanting a juicer for a long while but mostly for making jellies. My husband watched a documentary about a man who lost a bazillion pounds and got all healthy after drinking only juice for weeks, and now he's on the bandwagon. He's super excited that I found your post. I've been debating trying the juicing tread but being so picky when it comes to fruits and veggies I don't know if it be a waste or not.. 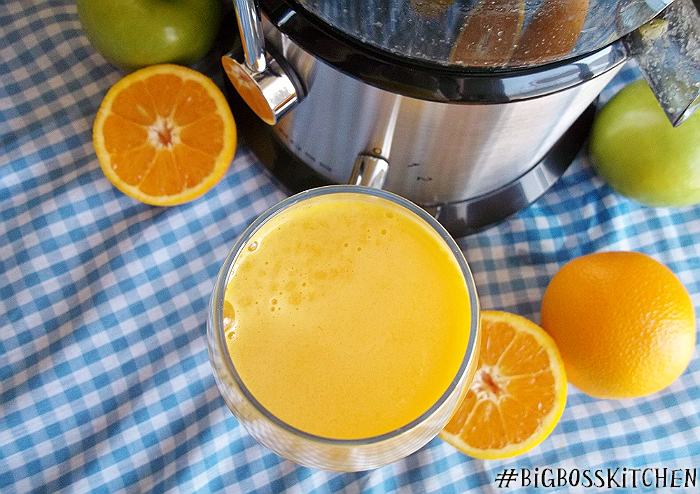 The big boss looks like the BOSS of all juicers. I love the fresh cup of OJ it delivered. Open the front door, I am on my way over. I love juicing. It's so healthy. Beets, strawberries & oranges make a great juice. Fantastic juicing tips. This looks like one amazing juicer. I should try one. That OJ does look delicious! I have never juiced before but may start now. When it comes to foods you have to remember the old saying, "Eat to live not live to eat." Especially now and days when people seem to be living to eat, and very badly at that! I've heard juicing can be wonderful but I do prefer smoothies instead. It's nice to see that you can use the pulp for other things-there are so many benefits of pulp! 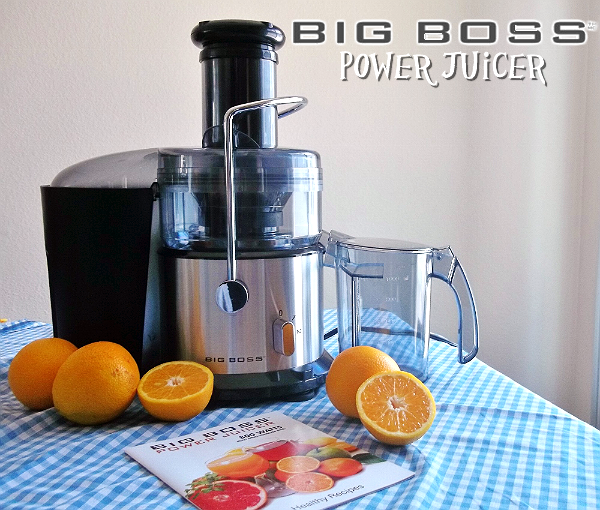 The Big Boss juicer looks awesome. I think I would like juicing, but then our produce here is kind of sketchy on a good day. Sooo...I don't know if I'd get the most out of it. I'd love to get more into juicing. That's a great looking juicer, thank you for all the info!